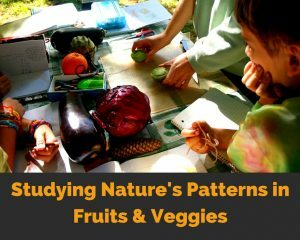 Stepping away from the mathematics textbook and looking at all the math connections there are in nature is an eye-opening experience. Looking for and finding math lessons in nature is an art and science that took me years to learn. It was 2003. I had been teaching in private schools since 1997 and I was burning out. I was teaching at a small private school in Newark, DE. Even though I was burning out for this short period of time, teaching at this school was one of the richest experiences of my career. Why? I had the time and freedom to write most of my classroom curriculum, except math. However, I was stumped on writing my math curriculum. I was single. I had the time to write my own curriculum and I was a voracious researcher. However, I was burning out, especially in math, because I was lacking inspiration and vision for where I was guiding my students. I was using a great Math curriculum, but, my students and I were bored with the mundane day in and day out math learning routines…the worksheets, the daily drills, the rote memory. Don Tolman, a special visitor, and gifted teacher and speaker came and spoke at our school. Don is a famed wellness teacher. He taught us about “eating from nature’s table”, or eating a raw food diet. He also taught us about numbers and concepts connecting math with nature called the Golden ratio and Fibonacci number series. I had briefly been introduced to these unique numbers in a Time-Life hardback book back in my early 20’s called Mathematics. Don explained how the Golden Ratio 1.618 is found in the proportions of many beautiful ancient temples, buildings over the ages and even found in the human body! He talked about the Fibonacci numbers 1, 1, 3, 5, 8, 13, 21, 34…etc which can be found especially in botany. The number of spiral turns found in many plants including sunflowers, daisies, pine cones and pineapples are usually Fibonacci numbers. The way Don passionately and enthusiastically explained the numbers and patterns and how they’re found all around us helped ignite and fuel an insatiable curiosity in me. I was motivated to get out into nature and look for these numbers and patterns. He taught us about the five most common patterns found in nature including, hexagons, pentagons, branching (fractals), spirals and the five-pointed star. I began craving more nature connection motivated by this enlivened knowledge and got outdoors every day with my camera. From 2003 – 2010 I went on a photographic nature awareness and connection journey looking for and documenting patterns in nature. I also began intensive research gathering resources I would use for years to come to build out my very own “living math” curriculum which I now call MathArt. Fast forward to 2010. I left institutionalized education and moved to Heathcote Community. I proceeded to open a nature-based homeschool program called Heathcote Art & Science Center. I was a Heathcote residential member at the time and had received community approval to run my program. Heathcote Art & Science Center (HASC) was for multi-age homeschoolers which served a total of 16 students from 2010 – 2011 ranging from ages 4 – 16. 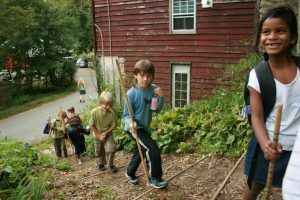 The program attracted a core group made up mostly of residential homeschoolers ages 5 – 11 years old. 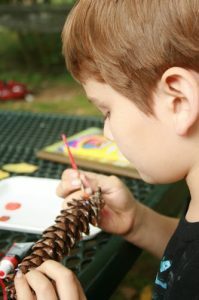 HASC homeschool student, Jack, looking at Fibonacci numbers found in a pinecone while painting each of the spirals. HASC was nested in a beautiful setting of 112 acres of forested land within the community. Heathcote even granted my homeschool students and me our own quaint learning center upstairs on the second floor within the old 1850’s grain mill community house, dubbed The Mill. The learning center overlooked a beautiful creek, gardens and a forest. It was a real paradise for studying nature’s patterns together. HASC students outside “The Mill” off on a patterns in nature observation hike. I bedecked the classroom with rich resources and learning centers. Here’s what I did to create a living, exciting and interactive classroom. Stocked every nook, cranny, and crevice of the room with activities relating the natural world with literature, art, history, and math. The children had endless learning opportunities guided by their curiosity. I gave them the resources and my students were unleashed from the usual “sit down and be quiet” mode I had been used to. It wasn’t hard for me to break away from institutional education’s usual methods of more sitting and less doing. I had been so ready for this change. I was glad to see children up out of their seats and following their innate curiosity and ability to learn. At the beginning of each program day, we had our “check-in” circle time where I explained some broad guidelines and showed them new fascinating resources to explore. On Tuesdays – Thursdays, after our circle time, they went on their free exploration either in the learning center or outdoors for four hours per day. My fondest memories of HASC include showing my homeschoolers the amazing patterns that are found in nature. On my second day of class, I set up a table in our playground area beneath a beautiful old tree. I proceeded to ask them to come gather around the table with their nature journals. They observed as I opened up numerous fruits and vegetables and looked at each of the patterns we saw inside. They were enthralled, especially when they were given permission to eat the lesson! After cutting into each fruit or vegetable, I let them eat the pieces. This kept their tummies full and them very happy during this full sensory activity. I asked my students to make sketches of each of the patterns they saw inside of the fruits and vegetable, in their journals. This is an easy and fun activity you can try at home with your learners. Try the Fruits & Veggies Cross-section Lesson! Proceed like I did opening each fruit and vegetable one at a time. Be prepared to photograph the priceless looks your children express on their faces while they look at the patterns. You can see them on my students below. On another fall day during the HASC program, I equipped my homeschoolers with brown paper bags and magnifying glasses. We set off outdoors exploring the 112 acres of wooded valley and scavenged the countryside looking for nature’s “living” patterns in nature. The main rule was not to collect any animals, although, we would stop and study animals that would allow us to handle and inspect them with a magnifying glass. We also were careful not to pick wildflowers unless they were the most common ones. During early spring, we even the rare and beautiful Pink Lady’s Slipper! Our live findings mainly included insects which we looked at carefully with our magnifying glasses. We collected our patterns in nature treasures and brought them into the learning center. I set up a table focused on nature’s circular patterns. You can see the video below of our display in the learning center. Another variation for looking at nature’s patterns is to go on a treasure hunt starting in your own backyard or local park. Wherever you have the easiest access to nature. 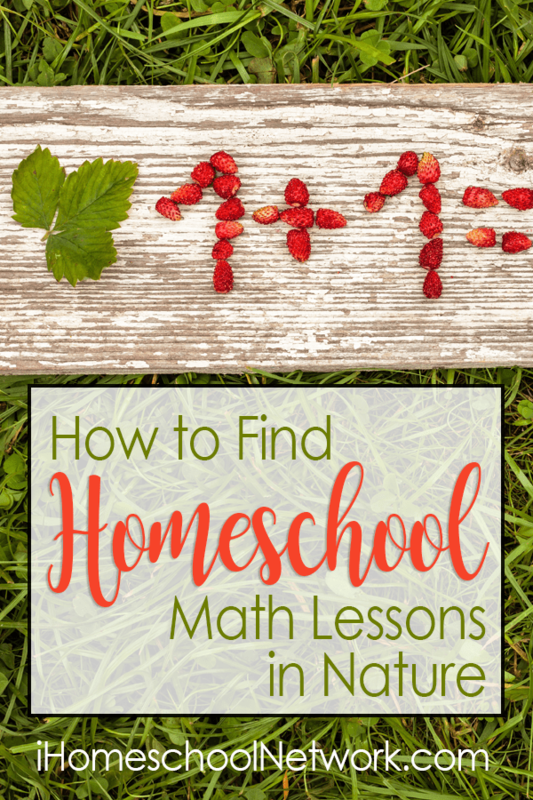 I suggest starting in your own backyard so that you and your children can not only participate in a very cool math and nature connection but also get to know the natural habitat of your own backyard first. Then you can try the same activity in surrounding local parks and forests. Try this simple activity using the materials and procedure below. The free patterns in nature template download. Do a short teaching about looking for the following patterns outdoors. Before going outdoors, talk with your learners about the five common patterns including hexagons, pentagons, branching (fractals), spirals and five-pointed star. Other patterns not on that list can of course also be found and considered “bonus” patterns. Also go over the Fibonacci numbers and how they can search for plants having any of the following numbers in spiral turns or numbers of petals or leaves: 1, 1, 2, 3, 5, 8, 13, 21, 34, etc. Ask students to find each of the five common patterns. You can start right in your own backyard or local park or forest. Students can collect their objects in a paper bag. I would recommend collecting preferably dead vegetation and non-living things such as wood or minerals. Learners can take photos of living things, rather than collecting them. The photos will still give images of the pattern. After collecting their patterns, come on into the house and set up a little display showing off each of the patterns. You can go as far as arranging them into an artistic display as well. 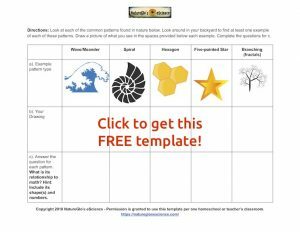 Have students use this free template to fill out about the most common patterns found in nature. Students can really take their time and have fun with this activity. It will give them a record of their special time outdoors. They can affix it in whatever notebook or journal they have. In 2011, I opened NatureGlo’s eScience, a math enrichment (MathArt) and science eLearning center for homeschoolers suggested for ages 10 and up. The MathArt online courses lead learners into more projects and activities such as what I’ve shared with you in this post. I hope you and your learners enjoy exploring the wonder and beauty that nature has to offer connecting math, art, and beauty! Have an awesome adventure-filled homeschool day! Gloria Brooks is NatureGlo, founder and head teacher of NatureGlo's eScience (NeS). NeS helps homeschoolers by offering live and self-paced online math enrichment (MathArt) and science classes. Gloria has a love and passion for researching, studying and meeting and observing animals outdoors in the wild. Her dedicated and sincere passionate study of the natural world has been brought to the homeschool community since 2010.